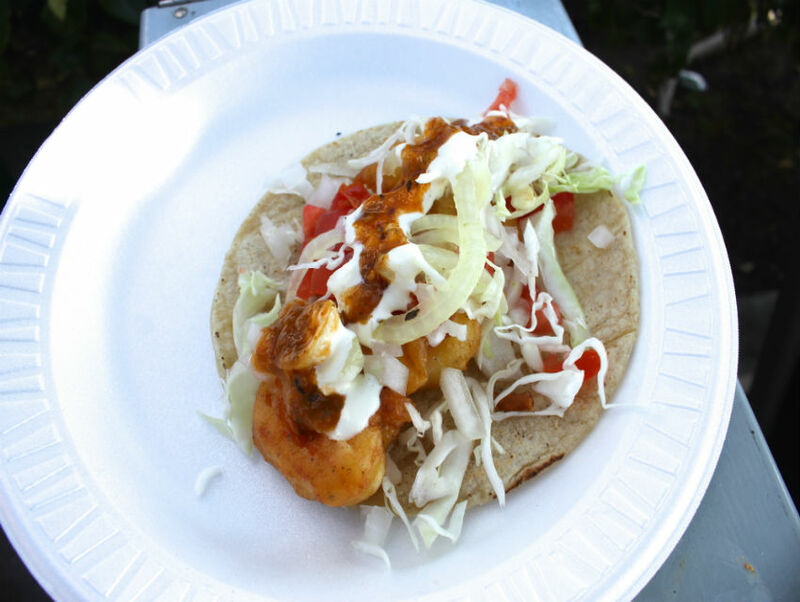 Since the dawn of the 21st Century, one fish taco has ruled them all on the Eastside, and until Ricky’s Fish Tacos opened up in 2009, Tacos Baja on Whittier Boulevard had been unchallenged. Today, in 2015, Tacos Baja boasts a non-stop queue on par with Pink’s Hot Dogs—and rightfully so—for their consistently good Ensenada-style battered fish taco. While Ricky Piña may still be the undisputed fish taco king in all of L.A.,Whittier Boulevard has a new fish taco champion, served from a customized hot dog trailer parked so audaciously close to Tacos Baja that they could practically squirt each other in the eye with limes. Juan Jose Aguilar worked at Ensenada’s Black Market fish stalls as a young man. That’s where he learned to make the battered fish fillets dressed with Mexican-style cream, salsa, and cabbage, and wrapped in a white corn tortilla that rose to fame in the 70s. A little over a month ago, Juan opened Mi Ensenada Fish Tacos on the south side of Whittier Boulevard just west of El Gallo Giro with his wife of 22 years, Estela. They are just doing Saturday and Sunday mornings and afternoons for now, serving Ensenada-style fish and shrimp tacos as well as ceviche. The flavor and cooking on the batter, which is light, thin, and crispy, finds the perfect balance with mild angelito (little angel) shark, sourced from Baja—Aguilar uses basa (Vietnamese catfish) when he can’t get angelito. The angelito along with dogfish are the traditional fish used in Baja fish tacos at the best places, like Ensenada street food institutions: El Fenix, La Floresta, and Fish Tacos Ensenada on 5th Avenue. Add their fresh pico de gallo, cream, thin-sliced cabbage, a selection of red or green salsa, cabbage, and pickled onions with a touch of oregano, and the whole taco merges into an explosion of flavor and texture that highlight the fish—the shrimp tacos are great, too. Business is picking up each week for Mi Ensenada, the new fish taco on the block, and while just down the street the line can be seen from space, the Eastside and Whittier Boulevard now have a new best fish taco from Ensenada.